While other African nations frequently experience military coups and conflicts, Senegal has seen political stability since independence. Nonetheless, the number of poor people, particularly in rural areas, remains high. SOS Children's Villages is helping to protect children and young people affected by crippling poverty and commercial exploitation. The Republic of Senegal is a country in western Africa. Ivory, gold and slaves used to represent Senegal's main exports during the 17th and 18th century. Ever since independence, Senegal has been one of the most stable countries on the African continent. Despite the country's political and economic stability, unemployment is widespread and around 30 per cent of Senegalese live in poverty. Many of them do not have access to clean drinking water, sanitation and medical assistance. They face a life in precarious conditions in which tens of thousands are struggling to survive, particularly in rural areas of the country. The number of rural poor in the country amounts to roughly 4.4 million. Thousands of young Senegalese are dreaming of Europe and are willing to risk their lives just to get there. Many have died at sea over recent years, trying to reach the shores of Italy or Spain. Senegalese workers work under precarious conditions, mostly without adequate protection and for incredibly low wages. Human trafficking within Senegal is common too. The SOS Family Strengthening Programme supported this family so that they could stay together (photo: C. Ladavicius)..
Around 15 per cent of all children between the ages of 5 and 14 are involved in labour activities. The majority of them work in agriculture, livestock and forestry. According to estimates, around 100,000 Senegalese street children are forced to roam the streets, begging for money and food. In Dakar alone, an estimated 7,600 beg the streets. West Africa is marked by one of the lowest girls' primary school enrolment rates in the world. Although the situation has noticeably been improving in Senegal, the crucial task here is to keep these girls in school once they are enrolled. Thousands of girls have to do domestic work once they are old enough and physically able to. 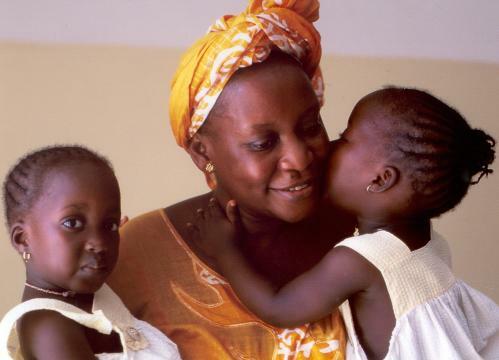 Senegal's child mortality rate has improved significantly since the 1990s: while in 1990, the Under-Five Mortality Rate was 151 per 1,000 live births it is now 43. However, a large number of children are still born underweight and nearly 20 per cent of all children under the age of five suffer malnutrition. SOS Children`s Village has been working in Senegal since the mid-1970s. Because of increasingly high levels of poverty, the organisation started an SOS Family Strengthening Programme, aiming to protect children who are at risk of losing the care of their family. At present, SOS Children's Villages is supporting Senegalese children and young people by providing day care, education, vocational training and medical assistance. When children can no longer stay with their families, they are cared for by their SOS mothers in one of the SOS families. SOS Children's Villages has also been running a number of SOS Emergency Programmes, providing food, medicine and school material to young people and children in need. In 2015, we started a project to protect "talibés" who are forced to go out to beg. We work in close partnership with local groups to ensure that the children are safe, can go to school and, wherever possible, can return to live with their families. We give children counselling and material goods to improve their living conditions. We provide school kits and uniforms and pay for the children's school and medical fees. We also run workshops on children`s rights and support parents so that they can make enough money to look after their children.